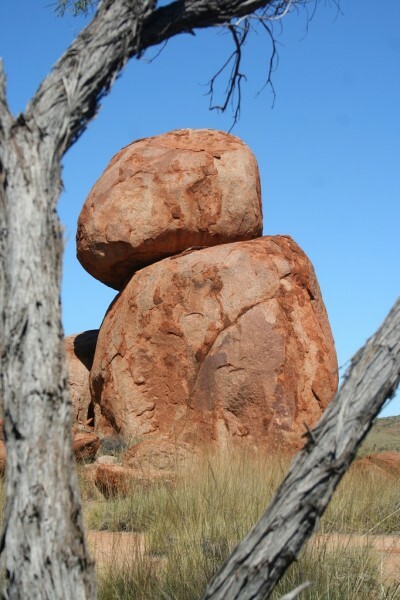 By 9am we were travelling north from the Alice to Tennant Creek, In the back of my mind today’s target was the “Devils Marbles”, a group of rocks just off the highway. Just short of Tennant Creek this place offers free camping for the night, free is always appealing. I certainly wasn’t thinking of aliens, aliens hadn’t crossed my mind at all. Until we stopped for petrol at a quirky place called Wycliffe Well. There outside, plain for all to see, were two little green men, well I say men there are certain anatomical differences between these green people like figures and men, we won’t go into those. The roadhouse has the self proclaimed distinction of being the UFO capital of Australia. Adorning the walls are newspaper articles about UFO’s from all over the world. They include stories from around the local district as well as the rest of Australia. 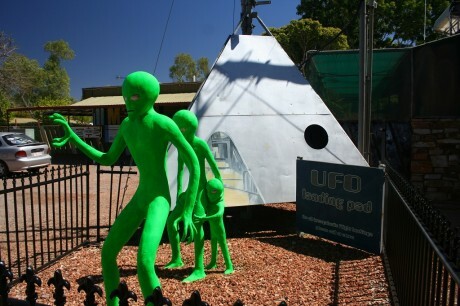 It seems in 1995 there had been a significant sighting close by and as the little green chaps hadn’t hung around so they had statues of them crafted. We ate lunch here and read the walls while eating. Great fun. From here the next stop was the Devil’s Marbles, an interesting group of huge boulders stacked on one another. Motor homes and caravans were settling in for the afternoon in this open, hot, dusty and windy site. It didn’t look inviting at all. We determined we would find a cabin in a motor camp for the night and headed to Tennant Creek. In retrospect we didn’t give this fascinating place a good chance, the conditions were just too bad.